With over 1000 hardscape jobs completed in the past 22 years you can depend on us for a professional job from start to finish. If you need more than just hardscaping …..we partner with the finest landscapers, designers, swimming pool contractors and carpenters to make your backyard dream become a reality. For more go to our portfolio page. We are a professional hardscape company that specializes in designing and installing pavers and retaining walls. Since 1992 we have been custom designing and building brick paver patios, driveways and walkways. We also install retaining walls from custom seat walls around brick patios to tall engineered walls. With today’s ever expanding selection of outdoor living products we pride ourselves in our wide range of services from the simple but classy paver stone patio or walkway to the more elaborate outdoor kitchens, with fire pits. stone boulders, water features and overhead structures like pergolas and roofed pavilions. 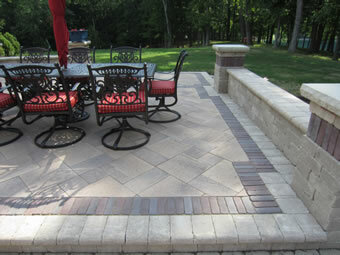 Brick Pavers, Patios, Sidewalks, Driveways, Retaining Walls, Stone boulders, Fire Pits, Fire Places and Seat Walls. As well as outdoor kitchens, bars, grills, and landscape lighting. Although our website show cases many large scale elaborate jobs our typical jobs are 300-500 sq. ft. paver patios on average homes. Because of our efficiency you will find that our costs are very competitive. See what our customer’s are saying about us Testimonials! Check out our before and after photo gallery among others!